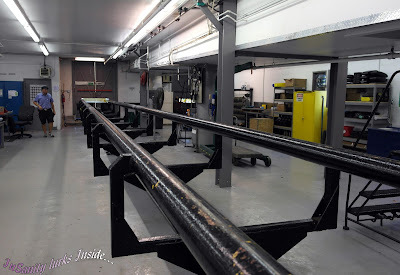 It's no secret I love doing "behind the scenes"' tours and for several years I'd been eying up the offerings at Busch Gardens Williamsburg, especially their coaster tours. For my birthday this year, I decided it was time to indulge myself and purchased the Ultimate Roller Coaster Insider Tour. With a price tag of $80 per person it's not exactly cheap but for you coaster fans out there, it's something I'd highly recommend. With this tour you get a rather impressive line up of roller coaster goodies most people will never get to see. 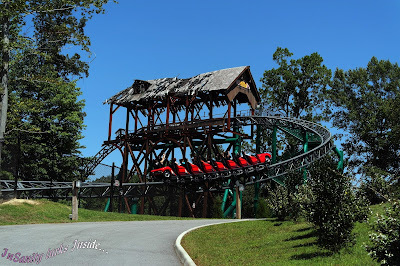 Busch Gardens Williamsburg certainly delivers your moneys worth! On the website you can catch a glimpse of the line up but reading about it and actually doing it yourself are radically different things! The version of the tour we purchased also included the Verbolten behind-the-scenes tour. -Riding the Griffon Trolley to the top of the 205" lift hill. 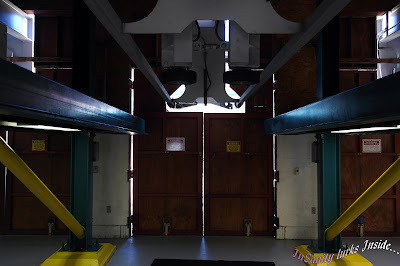 -Behind the Scenes tours of the mechanical areas of Griffio, Loch Ness Monster and Alpengeist. -Rides on Griffon, Loch Ness Monster, Alpengeist and Apollos Chariot. 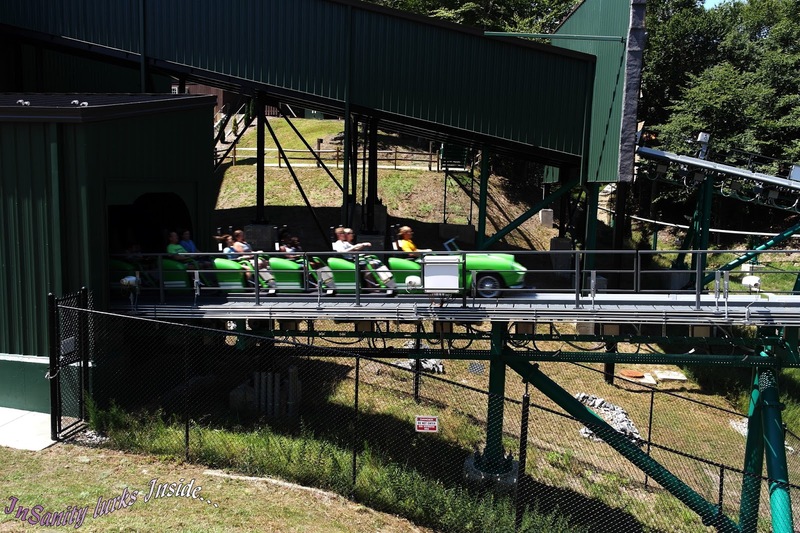 -Photo Opportunities of the ride behind the second lift hill and ride building. So as you can see, you get a LOT for that plus the tour has different options for non-riders. You can chose to either be a participant or just an observer, which is a nice touch if you have a non-rider with your group. Our day began bright and very early, I'm not much of a morning person normally but the lure of roller coaster goodness is enough to drag even my night-owl self out of bed before 7am (coffee helps). We were at a very busy front get at 8am and were escorted in by security, which gave us the best parking spot ever, the England lot right in front of the Pet Care building. The park hasn't even opened yet and we're the only folks waiting out front. At 8:45am our tour guide Jarryd was ready to roll and so were the 12 of us on the tour. We got inside a very empty, very surreal looking park and got on our way. 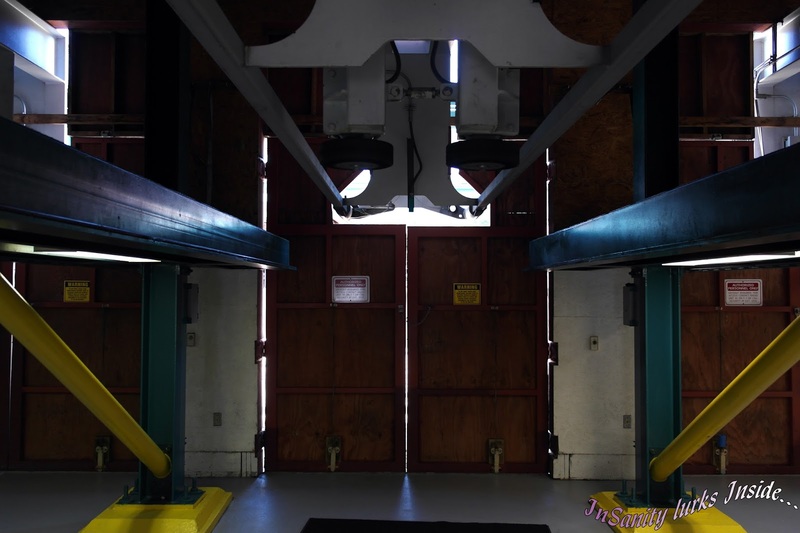 Up first on our tour was the Maintenance Bay of Loch Ness Monster. Celebrating it's 35th year, I was thrilled to finally get down here and check things out for myself. With this we got a basic education on how this ride operates as well as some fun history about the attraction. Such as Loch Ness Monster is a solid, continuous track. It was welded into place as it was constructed with an error margin of 'give or take five feet' which is unheard of in these days of perfect technical precision. We got to look at and touch various ride equipment such as wheels, anti-rollback hooks and lift chain. It was also interesting to find out that since Arrow Dynamics is out of business now, the company which now owns them S&S Power, has abandoned this ride. Busch Gardens now machines their own parts completely and has to send this coasters wheels out to be re-finished as needed. 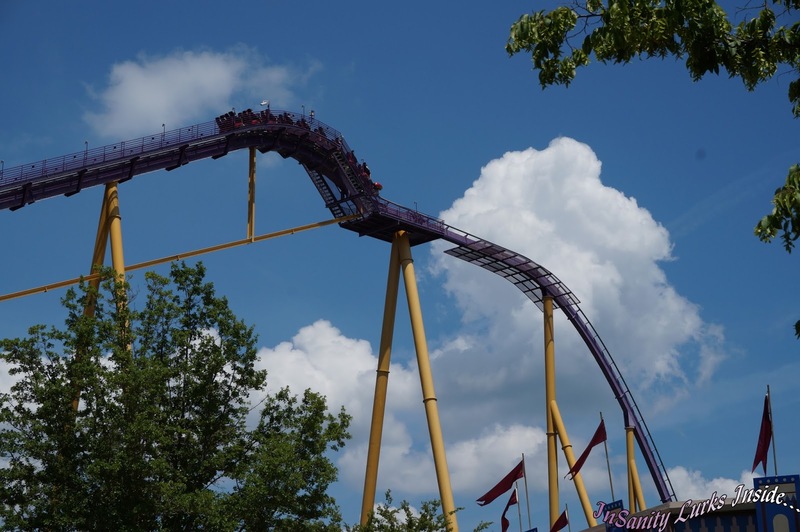 We also learned when Python down at Busch Gardens Tampa was removed, the majority of its ride equipment was sent to Williamsburg to be a parts doner to Nessie. Up next was Griffon, this is the part I was really looking forward too. Ever since I learned you could go up on the Griffon Trolley and get a look from the top, I've wanted to do it. So at this point I was giddy and excited, despite the very early morning start. You're loaded into the trolley, which wheels you up beside the coaster track. This allows you to disembark at the very top of the lift hill, where the train makes it turn to go to it's vertical drop. Now I've ridden Griffon a ton of times but that trolley ride to the top was scarier then when your riding the coaster! 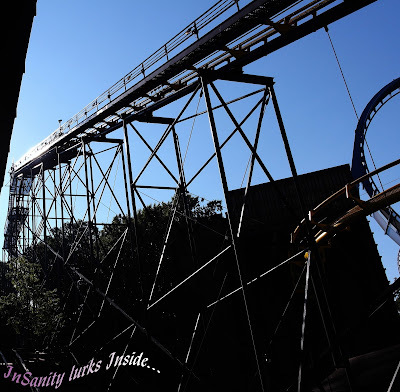 It lurches back and forth while climbing, giving you those momentary 'butterflies in the belly' feeling. The view from the top is simply breathtaking, your standing over the entire park including the other coasters. From here we watched the other rides going through testing below us and got am amazing view of the James River. One of the coaster trains was parked at the block brakes between the lift hill and first drop. 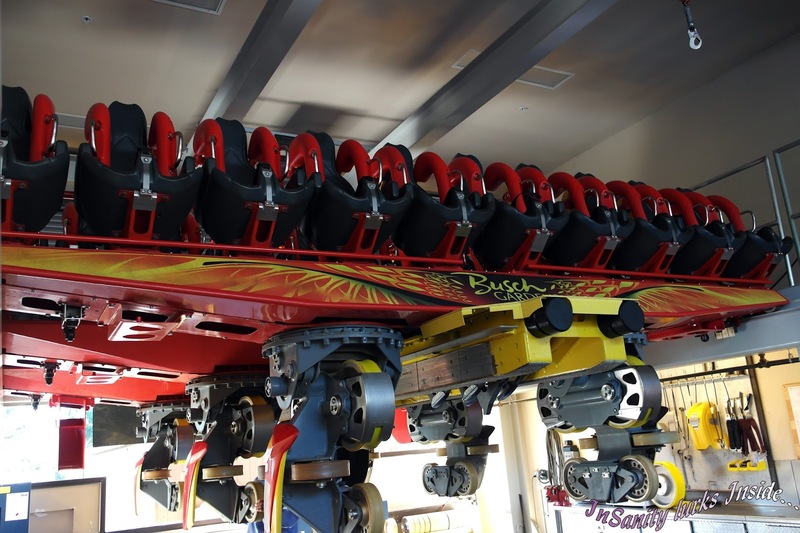 We got to see just how the ride accomplished the delayed hold before your drop, would you believe it's a separate set of anti-rollback brakes which hold you suspended for those 3 seconds? From here we moved down to the Griffon Maintenance Bay where we could inspect one of the coaster trains up close and personally. Would you believe that this 9 ton train is suspended by 12 tiny wheels so they can get underneath it? I have to admit, seeing that train suspended on two pieces of I-beam steal is slightly intimidating in that "this isn't gonna fall on my head, is it?" type way. Griffon has the coaster equivalent of all wheel steering, each series of wheels fully rotate and flex which is why the ride is so smooth. Our tour guide also explained how the restraint system works, for the few in our party who didn't already know (Coaster Geeks, Go figure). The reason your so safe on B&M coasters is the fact it takes power to unlock your restraint, it can't possibly unlock if the ride somehow looses power. To get you out isn't just a matter of hydraulics, without that power they have to either unbolt your harness from the back or remove it entirely. At this point we also go to watch the train pictured above loading onto the track, all three trains were on the track so we knew it was going to be a very busy day! The super special icing on this part of the tour was the fact we got first ride of the day on Griffon, as well as a second re-ride after this part of the tour. At this point the park was open and the ride already had a good sized line. Ever give that look of jealousy when someone gets priority boarding to a coaster without waiting in line? For once, that was me.. and it was glorious! Moving along, we next headed to Aplengeist. This was the first time in a long time I'd seen this coaster with a decent sized line, it was busy already at 10:30am. We headed into the maintenance bay which unfortunately didn't have a train inside due to the previously mentioned busy day and the fact it was running 3 full trains. We still got a look at the various equipment used as well as wheels and brakes, all the goodies. Apparently B&M and Busch Gardens have a special relationship. B&M tests new designs out at the Busch Gardens parks, that is why they often get the first-of-the-kind designs on their rides. Such as the 'Zero Car" on Aplengeist, that's the very front of the train where it looks like they could put another row of seats. 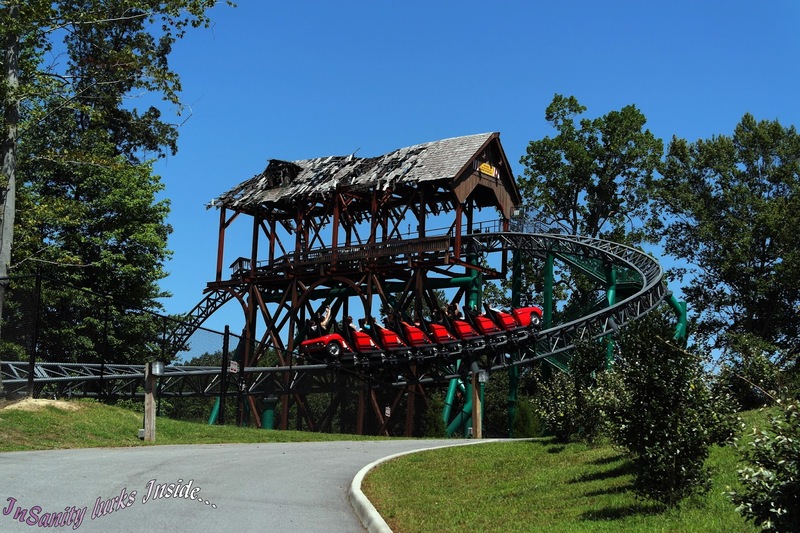 That thing was a first for Busch Gardens Williamsburg and B&M. In basic terms, the 'zero car' takes some of the initial Ge-forces away from the rider providing a smoother ride. 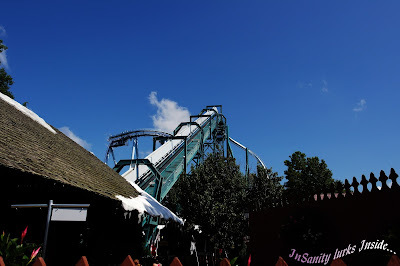 Also we learned another neat fact about Alpengeist. If you look at the picture to the right, you see the lift hill. This is very uncharacteristic of a B&M lift hill, which normally have sweeping supports. 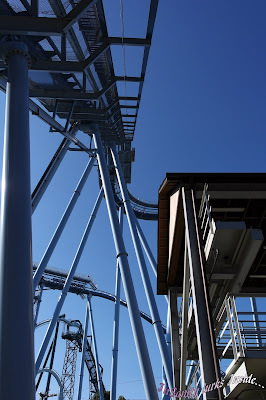 The supports for Alpengeist were designed especially for the close quarters and the terrain of Busch Gardens Williamsburg. They didn't have a lot of room to work with and didn't want the supports to overflow into the park around it, so it was designed with the 'ski lift' looking supports rather then the normal style often seen on other coasters. Finally we were escorted onto the ride, which shockingly gave our group our own entire train for the first run. We got a total of 3 complete rides on Alpengeist, while I admit freely it's gotten rougher over the years inverted style coasters are still a love affair of mine. Aplengeist is no exception. The final part of this portion of the tour was Apollos Chariot, which is the one coaster we didn't get to see the maintenance bay for. This is fully understandable since there really isn't a safe way there while the ride is operating as it's tucked in between the ride return track. That didn't stop our guide Jarryd from giving us plenty of information about the ride though! As another B&M first, Apollo's was the first of their coasters to feature the "T" style lap restraint rather then the previous 'over the should' style. The supports for this ride were also altered slightly to fit in the area it was slated for due to the road on one side and the majority of Italy on the other. We got exclusive seating on Apollo's Chariot, allowing us to enjoy the ride fully. From the top of the lift hill we saw just how busy the park really was as traffic was backed up onto the highway on ramp and reports vary that it may have reached all the way to I-64. We later learned this was due to the concert series, apparently it was some Disney Channel kid singing. I really didn't pay attention because seriously, coasters. We got two rides on Apollos then our group headed back towards the front of the park. We ended up back at Loch Ness Monster, it was finally time for our ride. Once again we were escorted in the back door, which is a challenge on Loch Ness Monster because it doesn't have a quick queue entrance, so we swam up the exit line. While they still won't answer questions regarding 'Nessie' in the tunnel, we enjoyed our exclusive ride. At the end all of us were given a special quick queue card for front of the line access but this is the only time you'll find 'Loch Ness Monster' listed among the coasters. Needless to say I have that special goodie horded! At this point our group had a one hour break, it was noon by now. At 1pm we all had to meet up once again for the Verbolten portion of the tour. Considering how busy the park was, we opted to pick up an unlimited quick queue pass and an adult style drink for our break then hightailed it across the park for Verbolten. This is easily the second biggest part of the tour that I was really looking forward to, I've wanted to see inside that ride building since it went up and this was my chance! To begin, we got the lecture about how photo restricted Verbolten was so you'll have to forgive me not having a ton of photos. Since a few members of our tour hadn't yet ridden Verbolten, that was the first order of business (aside from the no photos spiel). Then we got a look in the control room of the ride. I've worked my share of coasters but the technology on Verbolten is amazing compared to what I've worked on in the past. The building alone has it's own series of block monitors, showing exactly where each train inside is. This is aside from the bank of cameras already all over the ride. You can see clearly the drop-track segment and how it works from inside control, did you know that 'drop track' can reset in under 20 seconds for the next train? We also learned the Big Bad Wolf had some post-demolition revenge on it's successor in the form of 'ghost trains'. Really, it was a faulty sensor but the ride would report their being a train on the track when you could clearly see there was no such thing. During it's first year of operation this glitch would cause a cascade and require a reset of the ride but the operators are said to have called it "Wolfies Revenge'. After the Control Room we were walked around the ride building, giving us a look at the far side and the main drop. Verbolten was built to have very near the same footprint as Big Bad Wolf due to the nature of Williamsburg. They re-used the supports to avoid having to dig up the ground which could result in finding something of a historical nature, that would then halt construction was it was investigated by an archaeology team. That's why Verbolten and Big Bad Wolf share the same exact drop and footers! Next it was explained to us that two trains can't launch at the same time, the amount of power it takes to do that would simply brown out the park and possibly black it out completely. That is why it has a staggered launch, one train will launch inside while the other is on the drop track. 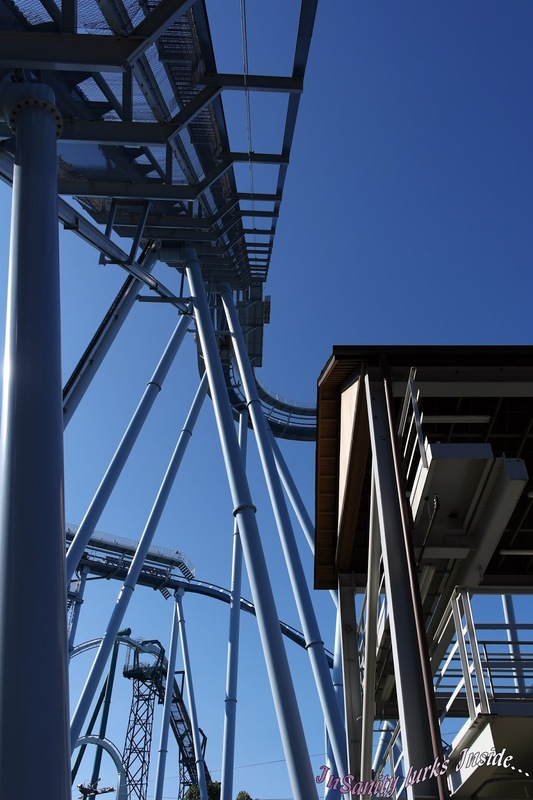 After the frist train enters and clears the launch, the second train will exit the building up to the main drop. Another fun fact is that Busch Gardens often uses their critters for landscaping, allowing their sheep to graze under the coasters were it might not be safe for a human to mow! Finally, the part I'd been waiting for, inside the ride building! It's dark, it's loud and it's purely amazing. To be honest, I'm not going to tell you much about inside the ride building. Because for some it would ruin the magic of the ride and for others trust me when I say you just need to see this! What I will say is that the effects you see while speeding past don't move, they are accomplished through lighting. Inside you can hear the power of the launch and the loudness of the drop-track portion much better then while riding as when your inside your not the focus of the audio. The older I get, the better the Birthday Presents! Overall, this tour was one of the best birthday presents I've had in a long time. 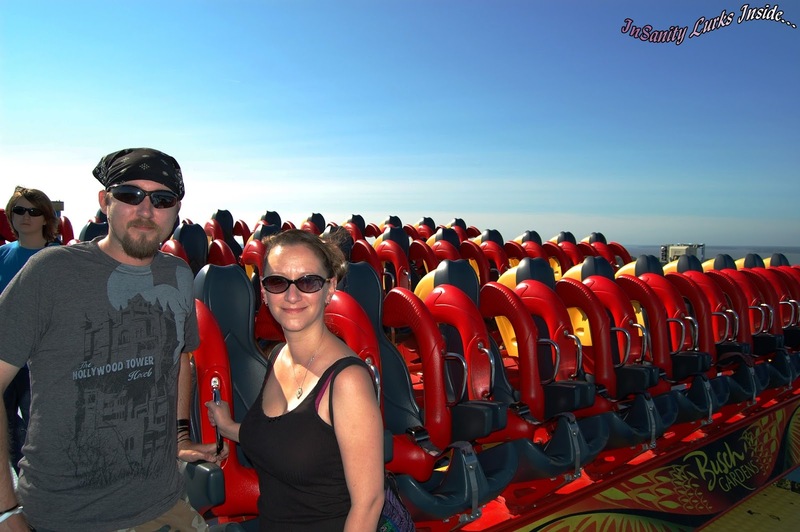 Not only did we learn some fun facts and even a few things about the coasters of Busch Gardens that we didn't know before, we got to see everything first hand rather then just hearing about it. 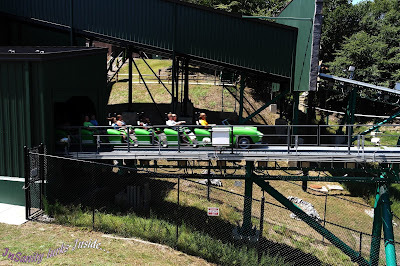 If you a coaster nut like myself, you should give serious consideration to taking this tour. Not only do you get to see the rides up close, get multiple re-rides on them and even get to touch stuff but the cost is instantly worth it the moment you board the Griffon Trolley and step inside the ride building of Verbolten! Important Note: This tour is only offered during spring/summer. Fun Tip: Talking to a few folks in our tour group I'm told if you watch Living Social starting around March you can often find many of the tours offered at Busch Gardens there for a discounted rate. The downside to doing this is it's not guaranteed through the park and you can't really change your dates once you chose them.